The California Wine country is best known for it’s rolling hills, patterned vineyards, and world class food and wine, but the region is also a well known destination for those who look to play a game of challenging, championship golf. In Windsor there is no better place than the Windsor Golf Club. 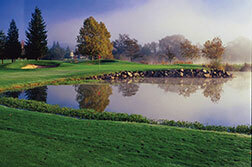 This 6,650 yard course was built in 1988 and has since hosted several PGA events. The 18-hole course is shaped around sprawling vineyards, mammoth oak trees and a creek that ripples throughout the year. The course is a par 72. Weddings and banquets are also held at the course featuring a myriad of fine dining options courtesy of the course restaurant, Charlie’s. No matter what the occasion Charlie’s is a wonderful place to celebrate, as it overlooks the course casting spectacular views. On Fridays and Saturday nights, reserve your evening for Murder Mystery Dinner Theater. You are encouraged to dress in Roaring ‘40s attire as you watch and participate in The Gumshoe Murders. Call 707-837-0019 or go to getaclueproductions.com.